Easy to follow instructions to form trays at home are included with order. Place a small bead of whitening gel within the inner facial side of the tray which will rest on the visible teeth. Do this for the upper and lower tray. Insert the trays and wear for 15-20 minutes daily for 35% gel and twice daily for 22% gel for up to 2 weeks.Shorter whitening sessions are achieved when using the BLUE Light Whitening Accelerator. Touch up as necessary before an important event or just to keep your teeth looking top notch. Rinse teeth and trays after each use. For more effective and accelerated whitening place small bead of gel within trays and insert into mouth. Insert ledge of BLUE Light Whitening Accelerator into mouth and rest lips around lip support. Turn on the light for 15-20 minutes. The BLUE Light Whitening Accelerator can also be used with Whitening Pen application. Can be used with or without custom whitening trays. Twist and click base of the pen until gel extrudes through the brush tip. Gently brush on the visible teeth. Wear for 15 minutes, then rinse teeth. If you have trays you can brush gel onto teeth and put in the trays. Can also be used with BLUE Light Whitening Accelerator. Rinse teeth after use. Remineralization gel is used to strengthen teeth enamel and reduce teeth sensitivity. Place a small bead of gel in the front and back of upper and lower trays. To be used after whitening process has been completed, it is recommended to use before bed for a thorough 6 to 8 hour nighttime remineralization. Continue using once a week for 3 to 4 weeks. Ingredients: Propylene Glycol, Glycerin, Carbamide Peroxide, Carbopol, Triethanolamine, flavoring. FDA approved. Made in the USA. Precautions: Do not use if you have a known allergy/sensitivity to peroxides or glycerol, etc. Products should not be used by children under 14, pregnant or nursing women. If any sensitivity or unusual sensations occur, remove trays, rinse mouth and brush teeth. You may then want to consult your personal dentist for further advice. We have designed the teeth impression process to be done simply in the comfort of your own home. With easy to follow instructions it should only take about 5 minutes to take your teeth impressions and then let our highly trained staff take it from there. 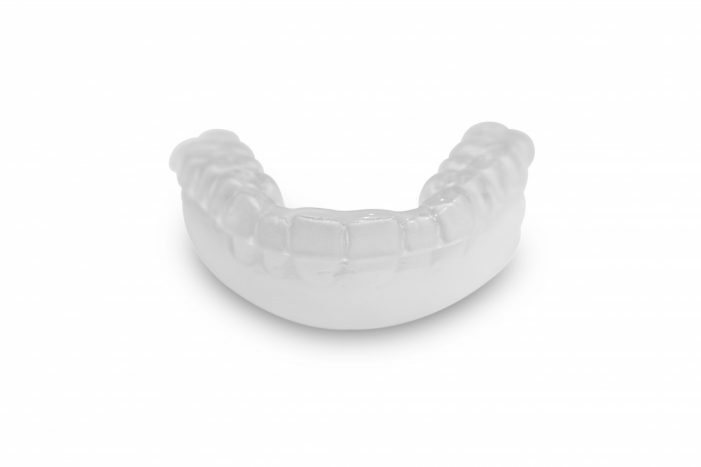 4) From your exact teeth impressions our skilled dental technicians fabricate custom fitted teeth whitening trays and mail the trays back to you in a carrying case and your ready to begin teeth whitening!